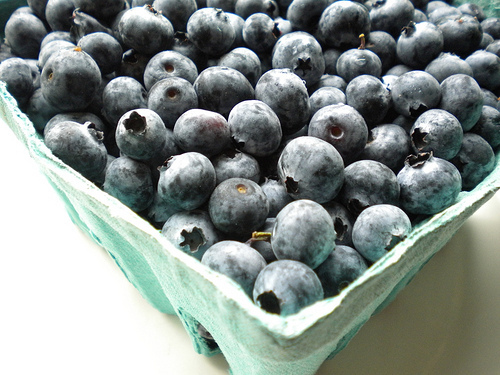 2 yummy gems for blueberries sent in by member Susan . Thanks for sharing! Prepare a simple syrup which is one part granulated sugar and one part water and dissolve on medium heat. Can also be tried with agave nectar but use less. Let cool. 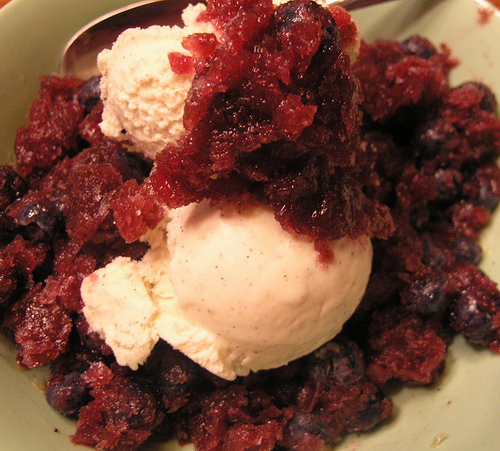 In a blender or food processor puree 4 cups of blueberries. Stir into the syrup in a shallow stainless steel pan. Cover with plastic wrap and freeze. Periodically scrape it with a spoon. Delicious with vanilla ice cream! In a large no-stick frying pan over medium heat, toast the oats by stirring until lightly browned and fragrant. Transfer to a medium bowl. Add the flour and cinnamon, toss to combine. 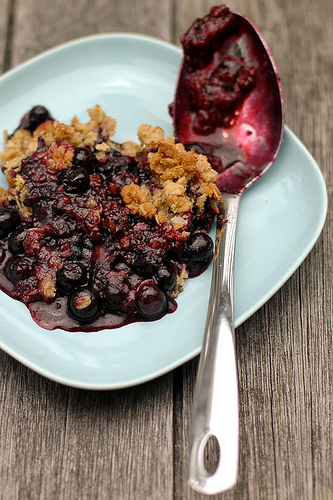 Drizzle with the maple syrup and stir with a fork until crumbly. Coat a 9″ pie plate with no-stick spray. Add the berries and lemon juice. Toss to combine. Sprinkle with the crumb mixture. Cover with foil. Bake at 400 degrees for 20 minutes, or until the berries are bubbly. Remove the foil and bake for another 5 minutes until the topping is browned.